"A Man of Unimpeachable Integrity"
The forty-third Secretary of the Navy, Curtis Dwight Wilbur, was born in Boonesboro, Iowa, on May 10, 1867. He was appointed to the United States Naval Academy in 1884. Shortly after graduation, Curtis Wilbur resigned his commission, a common practice at the time, and moved to Riverside, California. He was admitted to the California bar in 1890 and served as Los Angeles Deputy Assistant District Attorney. Curtis Wilbur moved to the Superior Court in 1903, and finally, in 1918, to the California Supreme Court where he served as Chief Justice. On March 19, 1924, Curtis Wilbur was sworn in as Secretary of the Navy. The first appointee of President Calvin Coolidge. Curtis Wilbur came into the position with a reputation as a man of high intellect and a character of "unimpeachable integrity." By the end of his term, Curtis Wilbur had achieved success in enlarging and modernizing the fleet and established a naval air force which would grow to become a potent component in the war with Japan. Highlights of the recent deployment included CURTIS WILBUR’s outstanding crew and their continuing achievements. Forty-seven enlisted Sailors earned the coveted Enlisted Surface Warfare Specialist qualification, while five officers in the Wardroom earned their Surface Warfare Officer designation. Additionally, two First Class Petty Officers earned qualification as Officer of the Deck for fleet operations, and one earned his qualification as Engineering Officer of the Watch. Finally, seven of CURTIS WILBUR’s outstanding First Class Petty Officers achieved career milestones as they were selected for promotion to Chief Petty Officer. In the five years since her Commissioning Ceremony, CURTIS WILBUR has proven to be an extremely versatile and capable ship. The men and women that serve in her continue to strive for excellence in order to meet the new challenges posed by today’s world. Shield: The colors red, white and blue in the coat of arms are reflective of the national colors of the United States. Dark blue and gold are the colors traditionally associated with the U.S. Navy. Blue stands for the oceans on which the Navy operates and gold reflects high ideals and drive for excellence. The anchor is reminiscent of maritime tradition and steadiness of purpose. The gavel represents Curtis Wilbur, the distinguished judge, for whom the ship is named. The hammer suggests his role in reviving shipbuilding at the beginning of the twentieth century. Since his objective was to build a strong Navy, the gavel and hammer are crossed to express strength. The embattled bordure alludes to the fortress-like quality of this class of Destroyer. Crest: The eagle is adapted from the Secretary of the Navy seal referring to Curtis Wilbur's tenure as Secretary of the Navy. The bald eagle, our national bird, is symbolic of power and authority and is indicative of Curtis Wilbur's support of naval aviation. 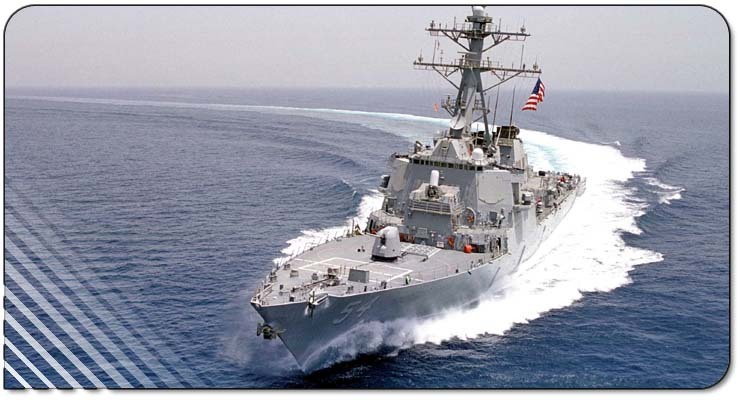 The three missiles are reminiscent of a trident, a traditional symbol of sea power, and a modern reminder of the power of the ship in the three realms of a Destroyer's control; air, surface, and subsurface. 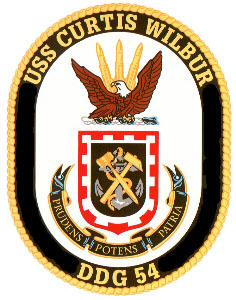 Motto: USS CURTIS WILBUR'S motto is Latin for "Judicious Power for Country"